One of the biggest challenges I had in my English classes was how to fit in grammar with everything else I had to teach. I would give students grammar pages and then we would correct them together. It was tedious and it took forever! What’s more is that students were not learning the way I wanted them to. They wouldn’t apply what they had learned from the grammar pages and activities. Grammar Circles. Grammar Circles are very similar to literature circles in the sense that students are teaching one another grammar. It is a fun and functional way to teaching and learning grammar. Although, this may be done individually, it can also be completed as a group where students, through a specific process outlined in the package, teach one another grammar. They also correct the work together, so the teacher has very little to do. 3) The Answer Key – devised to allow students to correct their own work and learn from one another. 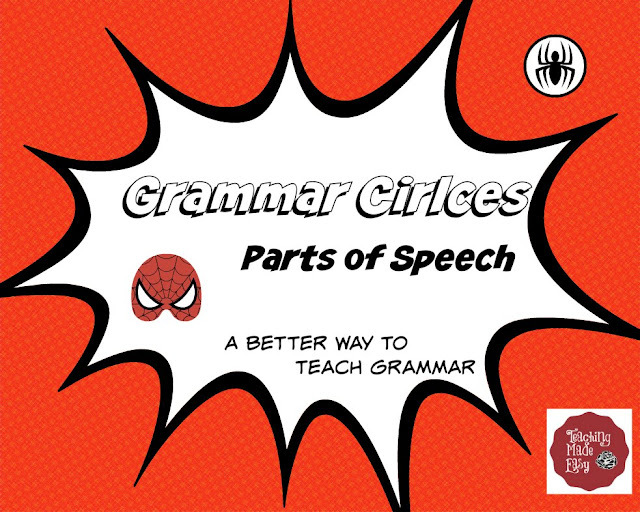 Stay tuned for more Superhero themed grammar circle units: Sentence building, Spelling tips, Capitalization and Punctuation…. Is Independence Day More than Just Fireworks?